Indianapolis, IN (October 31, 2017): David Weekley Homes, the nation’s largest privately-held home builder, recently received the Positive Development Award for the community of The Residences at Lawrence Village at the Fort. The home builder was recognized with this honor by the Lawrence Community Development Corporation during the fifth annual Community Dinner and Awards Night. The Positive Development award recognizes a corporation, group or individual for a residential or commercial development or redevelopment with significant and lasting impact on the city of Lawrence. The board and staff of the CDC review the significant developments that have been completed (or have substantial progress toward completion) in the city of Lawrence, and select one that contributes the most to the image and momentum of the city. For more information about David Weekley Homes in The Residences at Lawrence Village at the Fort, call 317-669-8634 or visit the model home at 5735 Buskirk Drive. 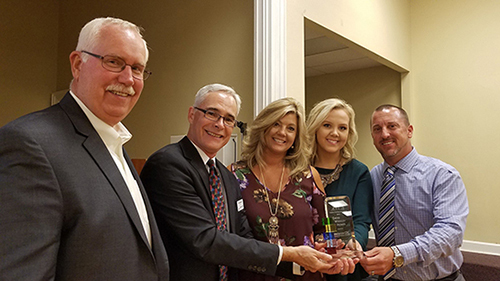 David Weekley Homes team members celebrate receiving the Positive Development award.